realistic objectives within an ecological framework. A thorough updating of all chapters to present important areas of wildlife research and management with recent developments and examples. A new online study aid – a wide variety of downloadable computer programs in the freeware packages R and Mathcad, available through a companion website. Worked examples enable readers to practice calculations explained in the text and to develop a solid understanding of key statistical procedures and population models commonly used in wildlife ecology and management. 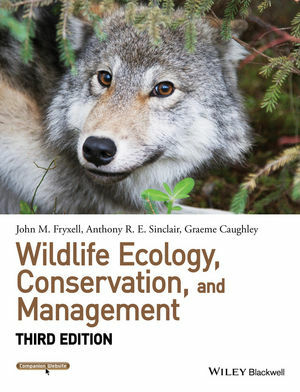 Professor John Fryxell currently teaches in the Department of Integrative Biology at the University of Guelph, Canada, where he has worked closely with a number of university and government scientists to develop sustainable conservation strategies for elk, woodland caribou, wolves, and marten. Previous to this he worked at the University of British Columbia and as Wildlife Consultant for the Provincial Government of Newfoundland and Labrador. His research has focused on the role of behavior in population and community dynamics of large mammals. He has a continuing interest in African wildlife, including long-term studies on the demography and spatial ecology of large herbivores and their predators in Serengeti National Park. Serengeti ecosystem of Tanzania, documenting multiple states in Serengeti savanna and grassland communities. He has also worked on endangered marsupial mammal populations and predation by exotic carnivores in Australia and similar systems in New Zealand. A glossary and an impressive 36-page reference list enhance the documentary and didactical value of this book, which is excellent for senior undergraduates and graduate students in ecology, biology, and environment sciences. However, it is equally valuable for professional wildlife managers, park rangers, and those working in ecotourism. The book has a most useful accompanying website where additional resources, power points and PDFs of all tables can be found.